Chandler Strayer ran his left forefinger under the line of words as he read the paragraph about a girl writing a letter to the president of the United States. After finishing the paragraph, he stopped to answer questions Indiana State University graduate student Violet Nwordu asked him about what he read. "What's the important thing that it says," Nwordu asked. "It's about polluting the air," the boy replied. At the next table, Hailey Clore, Kaleb Fortner and Mary Waugh read vocabulary words with ISU students Ryan Hanson and Jyoti Kolodziej. "It's important for you to know all these words so take your time reading it," Hanson urged the Van Duyn Elementary students in Clinton. Scattered at tables around the elementary school's library, the Indiana State school psychology graduate students worked to help elementary students improve their reading skills. As the ISU students prepare to become school psychologists, they focus on instructional assessment and intervention as well as mental health and counseling. By helping these elementary students with reading, the Indiana State students learn how to evaluate and teach children as well as gain valuable experience interacting with elementary teachers. This relationship between ISU and the Clinton school came about in response to the changing role of the elementary school psychologist. Indiana State wanted to make sure its students were prepared for their future work, according to Damon Krug, assistant professor of educational and school psychology. Previously, school psychologists would test children and determine whether they met the criteria for special education classes. Although that is called the test and place model, it more frequently came to be known as the wait and fail model as students who struggled did not receive help until they failed. "We're moving to a response to intervention model. We work with teachers where kids are initially struggling so that we don't have to wait two years for kids to fail before intervening," Krug said. 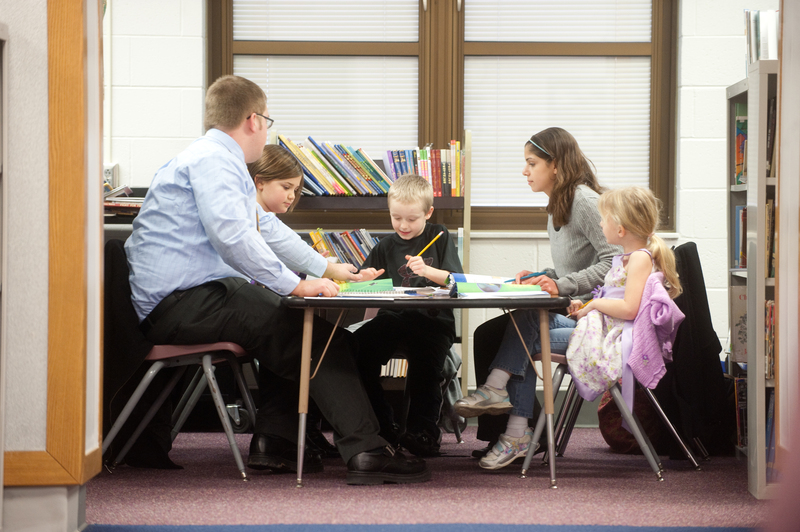 Indiana State's program prepares the graduate students by doing testing and small group instruction such as with the reading program. "They will have that instruction experience when they go into the school psychologist role," Krug said. Hanson, a graduate student from Terre Haute, agrees the experience he is now gaining will be important when he begins working for a school. "It will give me a greater background to draw upon in recommendations for reading to teachers," he said. Nwordu, a graduate student from Houston, said the reading program provides great experience. "It helps me learn to administer interventions and work with kids," she said. "If this was a job, I'd probably keep it. It's fun." In addition to helping the children with their reading, Hanson said the goal is more than that. "We want to instill a love and interest in reading," he said. That has happened, according to parents. "Last year, Lilly would have never brought me a book to read," said Kim English about her second grade daughter enrolled in the program. "She's bringing me a book every night now." English, who also brings her kindergarten son to the program, describes the program as a "godsend." "I prayed and prayed, ‘Lord do something because she's struggling,'" she said. Penny Clore enrolled her two daughters - fifth grader Rayven and second grader Hailey - because Hailey struggled with reading and she didn't know how to help her. "Hailey has a more positive attitude. She does not want to cry because she's so aggravated," Clore said about the difference she's seen. "Rayven wanted to come because she wanted to strengthen her reading." Mike Costello, Van Duyn principal, said the students have shown marked improvement in their reading, which impacts other subjects. "It helps to make social studies better, science better. It even helps in math with reading the word problems," he said. "Reading is the key to understanding what you're doing." Costello has requested Krug bring the program back next year and expand it to math. "We would love it if Van Duyn had a strong relationship with Indiana State," he said. "These kids love the grad students." Three days a week, the elementary students rush into the library with big smiles and school bags swinging from their arms as they head to the graduate students. During the school year, they will have spent 70 50-minute sessions together learning vocabulary words and sounding out words. All that time together pays off. Nwordu said Chandler has shown some of the highest improvement among the students. "When we started he was reading 80 words per minute," she said. "Last week, he was at 104. He went a letter grade up in English class." Ultimately, that is what the program is about, according to Krug. "It's great for our students' experience, but we're really here to help the elementary students," he said. 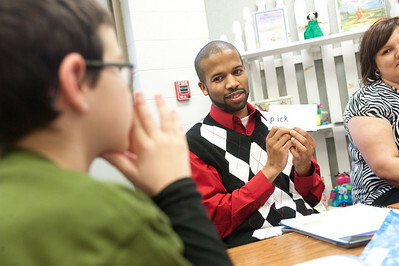 By helping elementary students with reading, Indiana State students learn how to evaluate and teach children.